“Sorry,” I mumbled as I stumbled over gray trousers and shoes on my way to the window seat. I pulled my book from my carry-on before tucking the bag under the seat ahead of me. I opened my novel and read a sentence or two. “Do you live in Rochester?” my seatmate asked. A reasonable question since that’s where the plane was headed, but I wasn’t in the mood for conversation. I was returning from my sister Margaret’s adult bat mitzvah at her Reform temple. I was proud of Margaret for making this commitment to deepen her Jewish knowledge and involvement—an opportunity we were denied as children; our Atlanta congregation did not teach Hebrew and offered neither bar nor bat mitzvah training and services—but it had been tough for me. In fact, I remember nothing about the service and reception, only her gratitude that I was there. Most of the participants had large, extended families celebrating with them. Margaret’s cheering section comprised only her husband and me. I was barely functioning, much less cheering, fifteen months after my daughter Ruth’s death. “I was at my nephew’s bar mitzvah, and it was fantastic,” my neighbor volunteered.. I grunted and turned the page. If he had to talk, couldn’t it be about something else? Ruth’s ground-breaking bat mitzvah, when she conducted an entire Rosh Hodesh (new moon) service, was only eight months before she was struck and killed by a drunk driver. Now, two years later, the mere thought of this coming of age ceremony was still too painful to bear. I certainly didn’t want to hear about some unknown kid’s celebration. The proud uncle persisted. He boasted not so much of his nephew’s prowess as of his brother’s wealth. There were two bands so that there was never a moment without music. There were grazing stations with prime rib roast and veal and who knows what else. There was, of course, more than one bar. His account of flowing liquor made me queasy. The man whose car had plowed into Ruth and her walking companions, killing three young people and seriously injuring two others, had reportedly spent six hours in a hotel bar, drinking. “And your nephew? What did he do?” By this time, I had given up on my book and looked over at the man’s graying hair and clean-shaven face. His smile was as expansive as his descriptions. I pictured Ruth and her friends moving gracefully to the music of a college-aged guitarist who played all their favorite Israeli dance tunes. Younger children had fun on our swing set while adults nibbled catered sweets and chatted. This simple backyard celebration seemed to me more in keeping with a party for a young teen than an expensive gala with multiple bars. I pronounced these words slowly and with feeling. They came from my heart and my pain at a time when I could filter neither. My neighbor’s smile dissolved into a frown, he sputtered, then was silent. Relieved, I spent the rest of that plane ride reading. In retrospect, I’m a bit embarrassed by my unchecked honesty, but I haven’t changed my opinion about “over-the-top” bar and bat mitzvah celebrations. If I sound judgmental, it’s because I am. When a Jewish boy turns thirteen, he is morally responsible for his own actions. With or without an official ceremony, he is considered an adult member of the Jewish community. Girls of the same age are equally responsible for their actions and maintaining the tradition. I have trouble praising a bar or bat mitzvah celebration that is all about the party, the dessert, and not about the main course, the recognition of the young person’s Jewish accomplishments and his or her responsibilities as a full-fledged member of the Jewish people. Bar Mitvah: Joey prepares to read Torah. On a September Monday morning, his great-grandfather’s tallit draped across his shoulders, he chanted the section of Deuteronomy that Jews the world over read that day. At the conclusion of the service, there was a little circle dancing before we followed Joey and his friends to the school lunchroom for donuts, bagels and fixings. After the students (except for Joey and his sister, Ruthie) had returned to classes, Joey’s father gave his son a beautiful blessing. And that was it! Simple. Meaningful. And, from my perspective, perfect for Joey’s non-flashy personality. I suspect that his sister’s upcoming bat mitzvah will be neither as bare-bones nor as small—unlike her brother, Ruthie likes glitz—but it will still reflect the family’s emphasis on Jewish learning and practice. Like Joey’s (and those of my children, older grandchildren, and sister) it will celebrate Ruthie’s Jewish accomplishments and her awareness of her new adult responsibilities. A month after his bar mitzvah, I asked Joey what it had taught him. I smiled. This was exactly what I had hoped my children, and now my grandchildren, would get from their bar/bat mitzvah experiences: a strong bond with the Jewish people, the sense that they are not only connected to the tradition but are part of its continuation. “If, someday, your children ask you to tell them about your bar mitzvah, what do you think you’ll say?” I asked. Granted, he was still living in the afterglow of the powerful event, but listening to Joey, I couldn’t help pondering the boy I learned about on that long-ago plane ride. He must be in his forties by now. Is he a practicing Jew? What kind of Jewish example does he set for his children? Is he a moral person? A philanthropist? A volunteer? I wonder, too, if his children ask about his bar mitzvah, and if so, how he answers. Does he remember the religious service (although his uncle didn’t mention it, surely there was one) or only the extravaganza? Was he impressed or embarrassed by his parents’ display of wealth? 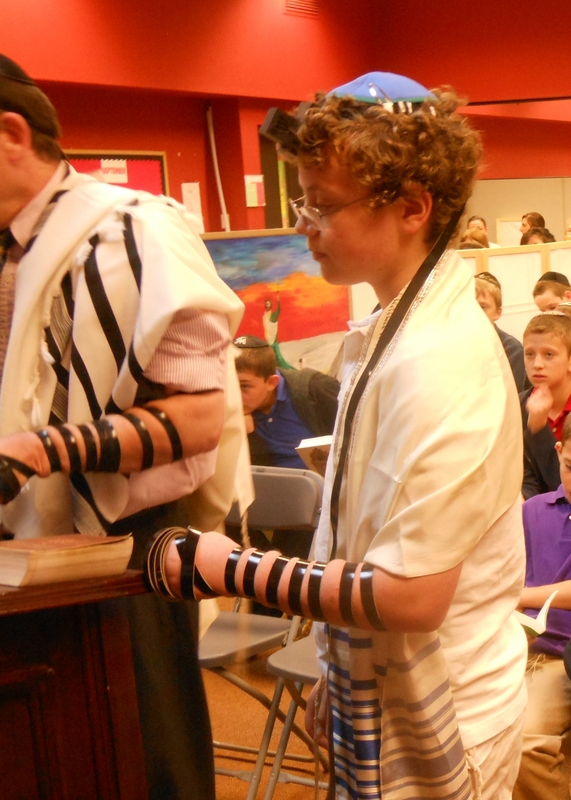 What values did he learn while preparing for his bar mitzvah? Most of all, I’d love to know if his “coming of age” ceremony helped him feel, like Joey, more connected to his Jewish tradition and community. I won’t be around to see Joey in his forties, but I predict that thirty years from now he’ll be living a Jewish life and working, in his gentle way, to make the world a better place. 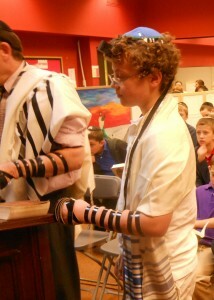 His bar mitzvah will have been a key stepping stone toward a Jewishly committed adult life. Could a Jewish Grandma ask for more? A note: To the other Grandmas out there who would like to make a comment but aren’t sure how: Click on “comment” next to the title, and a comment screen will appear. I’d love to hear your thoughts on coming of age celebrations. although i have never met joey, i too am proud of joey and his family, for knowing what is important on such an occasion; the passing of our traditions which have kept us as a people that no holocaust could erase. and yet, today, we are loosing more of our people because they don’t know what a rich heritage they come from. g-d bless joey and his family, there will be a continuity with him, thank g-d.
What you experienced at Joey’s bar mitzvah is what my parents called,”True Yiddishe Naches.” How blessed we have been to have celebrated our childrens’ bar and bat mitzvahs and share with each other the joy of our grandchildren’s time. Without thinking of it before, I realize that we both had our kids parties as “heimishe” backyard get togethers after the joy of seeing our children take on the joy and responsibility of being a Jew. BJ, that’s EXACTLY why I left the kosher catering business. My idea of a Bar Mitzvah celebration was in line with yours, but my business required me to sell in line with his: ice statues, grandiose smorgasbord tables that filled people up before the dinner, elaborate dinners where plates often came back untouched because the hors d’oeurves and smorgasbord had stuffed them, and Viennese Buffet tables at the end. If I sold this stuff, I felt guilty because I didn’t believe in the extravaganza and waste involved; if I didn’t sell it, we made no profit on the party. A no-win situation! This is a talent I never knew about Dr Isaacs! U know we still need a kosher caterer. How ’bout it? I could read your writings all day! And don’t be so sure about being around for Joey’s 40th. Gd has quite the sense of humor. This is illuminating – thank you for sharing it. I haven’t heard anyone discuss different attitudes to the celebrations – glitzy vs. simple, etc. – and you express your perspective beautifully.